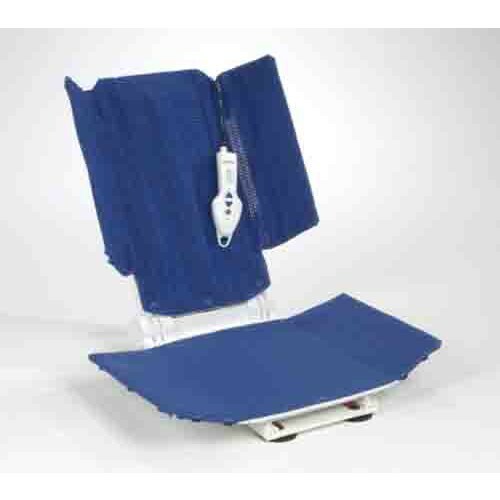 The Aquatec RSB Bath Lift, by Clarke Health Care Products, are specialized lifts that help people lower and lift themselves into and out of a bath. The RSB line of Aquatec models have a specialized backrest that curves around the shoulders and upper torso for a more secure seat. This motorized chair lift allows those who would not otherwise be able to sit in a basin unassisted, finally be able to relax in a hot bath with a simple touch of a button. The Aquatec RSB Bathliftis a type of patient lift that raises up to the lip of the bath basin to allow one to enter the chair and lower themselves with a remote control that has simple, bold-colored buttons that represent the up and down directions. 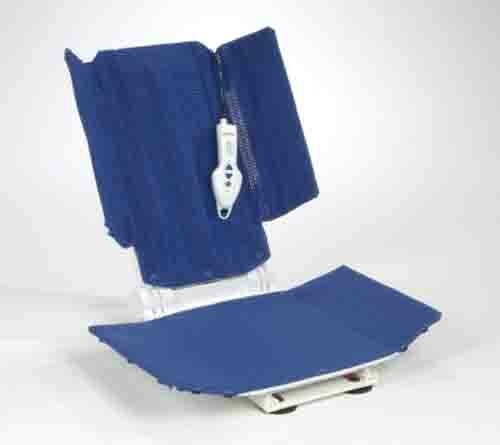 The reclining backrest will let the bather ease back in their seat as much as 40 degrees to relax as well as provide an angle to wash and rinse the hair. The Aquatec RSB chair is connected to the basin using oversized suction cups built into the bottom of the chair. Aquatec bathlifts are constructed from reinforced plastic and stainless steel components. The chair comes with a non-slip surface and comfort covers. The chair covers are removable and machine washable. The motor comes with a safety feature that will not allow the lift to lower if there is not enough battery power to raise the bather. This will help ease any worry about getting stuck in the lowered position. If the battery runs low, a light on the remote will illuminate prompting the user to plug in and charge the battery. Look to the Aquatec Bathlift for the regular backrests that are narrower. The bath lift will raise and lower bathers who could otherwise not enter a bath by themselves. The RSB model has extra-wide back rests to secure the upper body in the chair. The chair comes with a non-slip surface and washable covers. The seat is contoured to prevent slipping off. Suction cups on the bottom of the chair keep it from slipping. The chair has a stable and rust-free frame, reinforced lifting scissors and bottom plate. The backrest reclines up to 40 percent.